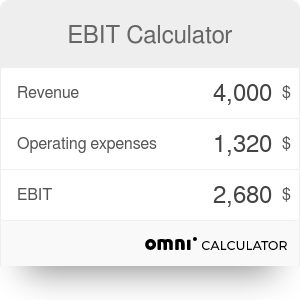 EBIT Calculator is a tool which helps you calculate EBIT - one of the most popular and important indicators in business and finance. What is it? Keep reading, you are in good place to learn about it! Below you will find some information about what is EBIT and how to calculate EBIT, and, also, a quick comparison: "EBIT vs EBITDA". We do hope that this article will fulfill your expectations and quench you thirst for knowledge. EBIT (Earnings Before Interest and Taxes) is the operating profit - the profit before deduction of taxes and interest. This rate is used to compare the operations of different companies in given periods. EBIT makes such comparison possible because it doesn't include interest rates or how the companies exploit the financial leverage or tax burden. It considers only the basic activity of a company which is probable to repeat in future, so it shows its real capabilities to generate earnings. EBIT lets you measure the potential of a company so it can be very useful and helpful in some cases: for example, when an investor wants to buy an enterprise out or when we want to compare different companies which operate in different tax systems or have different strategies. We can distinguish between two different points of view at EBIT: accounting and financial. Considering the first one, we can say that EBIT is 'the sales decreased by operating costs', while from the second perspective, it can be explained as 'the gross profit decreased by interest'. As we already know what is EBIT, we can smoothly go to a comparison: "EBIT vs EBITDA". EBITDA is a very similar rate. First of all, let us expand the abbreviation: Earnings Before Interest, Taxes, Depreciation and Amortization. As we can see in its full name, it is the same as EBIT, but it includes two additional aspects: depreciation and amortization (DA). It works similarly - it is also used to compare the profitability of companies only on the grounds of data connected with their basic activity; it also omits the effort of their financial strategy or tax system. Actually, EBITDA is very easy to calculate: it is enough to add DA to EBIT. Then, having the same data from another company, we can easily compare them and see which one works more effectively. We hope that this text has helped you with understanding what is EBIT and how it is used in business. If you are - or plan to be - a businessman, we wish you all the best of luck! EBIT Calculator can be embedded on your website to enrich the content you wrote and make it easier for your visitors to understand your message.